Create a new Trailhead Playground for this superbadge. If you use an existing org, you will run into problems when validating the challenges. Note that your Trailhead Playground already has My Domain turned on. DO NOT edit the My Domain settings. Install this unmanaged superbadge package. This package contains the schema needed to complete the challenges. If you have trouble installing a managed or unmanaged package or app from AppExchange, follow the steps in this article. Your Trailhead Playground opens in Lightning Experience, but you need to switch to Salesforce Classic for some prework setup tasks. You'll also need to switch back and forth between Lightning Experience and Salesforce Classic to configure and test some of the features specified in the challenges. 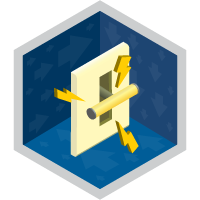 Prepare your Trailhead Playground for this superbadge’s challenges. From Setup in Salesforce Classic, override the account tab with the Accounts Tab Visualforce page, which is included in the superbadge package that you installed earlier. Also in Salesforce Classic, add the TrailheaDX component to the DE Default Home Page layout. From Setup in either Salesforce Classic or Lightning Experience: Create a user named John Wiseman and assign him to the Salesforce user license and the Custom: Sales Profile profile. Create a second user named Paloma Espinoza and assign her to the Salesforce Platform user license and the Standard Platform User profile. Use the naming conventions specified in the “Business and Technical Requirements” section to ensure successful completion of the challenges. Some folks wear shoes to get from point A to point B. Others wear shoes to be seen at points A, B, and C. The clientele of Lusso Scarpe (pronounced loo-so scar-peh) most definitely falls into the second category. Lusso sells a select line of designer footwear online and in upscale boutiques, and uses Salesforce for all its sales and service operations. Lusso Scarpe also has a successful wholesale business unit. But there are a large number of new competitors specifically targeting some of their key segments. The direct to consumer online business has a loyal group of regular customers, but is growing more slowly than the market as a whole. Salesforce Lightning Experience, packed with new features that drive productivity, is a key component of Lusso Scarpe’s strategy to move through these challenges. You’re the lucky specialist who consults for Lusso Scarpe for all its Salesforce needs (and you get the much sought-after employee discount). Your mission, should you choose to accept it, is to move the company’s org from Salesforce Classic to Lightning Experience. You will not only help the company make the rollout as smooth as possible, you’ll ensure that sales and service reps get up to speed with using the new features that increase their productivity. The folks at Lusso are used to luxury. Let’s give them white glove service. Lusso Scarpe uses standard Salesforce objects to store all its data. Here are the objects you’ll be working with. Account - Companies that Lusso Scarpe does business with, including resellers and suppliers. Contact - Direct customers or employees of Lusso Scarpe's accounts. Opportunity - Potential wholesale deals. Campaigns - Targeted marketing exercises aimed mostly at online customers. Cases - Queries or complaints raised by accounts. Your Lightning Experience rollout strategy doesn’t include any plans to add relationships or objects to the schema. Why create complexity, right? To help define the requirements for rolling out Lightning Experience to Lusso Scarpe, evaluate how their current implementation works in the new interface and see if there are feature gaps or problems you'll need to address. One of the first things any Lightning Experience Rollout Specialist worth their salt does is run the Lightning Experience Readiness Check. Who wants to manually comb through an org looking for issues when there are automated tools designed to do just that? Review the resulting reports to get a handle on the users who are ready to switch, features and customizations that are good to go, and any technical issues you may need to resolve. Run Optimizer then review the Optimizer Report to see if Lusso has unused features, including fields, page layouts, record types, and validation rules, that you can leave behind. Real-world use is your best guide for knowing how well Lightning Experience will work "out of the box" for Lusso Scarpe, or which features and customizations you should address before asking Lusso employees to use the new interface. As part of your evaluation, enable Lightning Experience as-is for your most enthusiastic, trusted users (your champions!) and get some quick, actionable feedback. From the "Which Users Are Ready?" section of the Readiness Report, you know that none of Lusso’s user profiles are quite ready yet for Lightning Experience. But John Wiseman is Lusso's biggest Salesforce fan and he's looking forward to diving into Lightning Experience. Plus, as a sales manager who often pitches in to troubleshoot customer issues, he’s savvy about the needs of both the sales and support teams. He’s an ideal champion for a short, fact-finding pilot program! Give John access to Lightning Experience and see what he thinks. As Lusso’s communications lead for the sales team, Paloma Espinoza manages the company’s Chatter groups and communicates with Lusso’s top accounts. Include Paloma in the pilot so you can get her perspective and feedback as well. She wants to go all-in on Lightning Experience so remove her access to Salesforce Classic. Everyone at Lusso Scarpe needs to use Lightning Experience and they all wanted in on the action yesterday. But you know the best way to turn initial enthusiasm into whole-hearted adoption is to roll out the new interface in phases. Start with a small group whose business needs are well served by Lightning Experience. Then collect feedback, fine-tune things, and roll out to another small group. Rinse and repeat. It's the best way to ensure every Lusso Scarpe user is productive and successful from day one. Based on Lusso's business priorities—plus guidance from the Lightning Experience Readiness Report and feedback from your two pilot users, John and Paloma—you've decided the best strategy is to roll out Lightning Experience in two phases. First up, you'll transition Lusso's sales team. Later on, you'll move the support team. Based on your evaluation of Lusso Scarpe's org in Lightning Experience, feedback from your champions, and Lusso stakeholders' input on necessary business processes, your rollout plan includes these requirements. What does Lusso Scarpe want to do? Sell more of its amazingly luxurious shoes more quickly, of course. Prepare Lightning Experience so it’s ready to roll out to Lusso's sales team. In the Lightning Experience Readiness Report, you see that Salesforce isn’t planning to support Documents in Lightning Experience. But the Lusso Scarpe sales team makes regular use of Documents, so it’s important to address this gap before you start the first phase of the rollout. You need to figure out how to make the resources that are stored in the document library in Salesforce Classic available from Lightning Experience. Given feedback from the pilot program, you’re comfortable that you can delay addressing the other issues noted in the Readiness Report until a later phase in your rollout. But both John and Paloma indicated that working on the Accounts home page in Lightning Experience is confusing because the page looks like Salesforce Classic. Lusso has overridden the Accounts home page with a Visualforce page. The page works correctly in Lightning Experience but you need to restyle it so it has a Lightning Experience look-and-feel. To get the sales team off on the right foot, make sure Lightning Experience addresses these use cases for phase 1 of the rollout. Lusso’s collection for the new season is out, and it’s been a huge hit, particularly among those with a lack of sparkly shoes in their life. Participating in Milan's Fashion Week has definitely paid off. With the flood of inquiries coming in, especially for the wholesale business unit, sales managers need to make sure that sales reps stay focused on important tasks so they can close deals quickly. Qualification Account Name, Opportunity Name, Description - Ask the buyer about their favorite footwear. - Share the most appropriate sections of our catalog. - Share testimonials from fashionistas. - Present our most popular ranges to the buyer. Needs Analysis Expected Revenue, Main Competitor(s), Next Step, Probability(%) - Ask about the maximum price that the buyer is willing to spend. - Ask: "Is there anything else you'd like to know or need to proceed with the purchase?" - Set a date for follow-up. Negotiation/Review Amount, Quantity, Stage - If the buyer seems likely to walk away from the deal, discount 5%. - Follow up on questions or needs from the buyer. Closed Lost Close Date, Next Step - Create post-mortem notes. - Set a follow-up date for 1 year from today. Closed Won Close Date, Delivery/Installation Status - Celebrate in Chatter! - Check with the Accounts team for payment processing. Customize Accounts so sales reps see a highlight of the details they care about most, while Paloma sees a highlight of the details she cares about. During the pilot program, John reported that, when using the Lightning app called Sales, he had to do a lot of extra clicking to get at the items accessed most frequently by sales reps. After a quick survey of the sales team, you know that reps regularly work with these pages and objects: Home, Accounts, Opportunities, Campaigns, Leads, Contacts, Reports, and Dashboards. Configure the Sales app so reps can quickly access these critical items without a lot of extra navigating around. Keep track of their most recently viewed contacts, opportunities, and leads. See a list of their new accounts on a weekly basis. Quickly create new opportunities and log calls made to contacts. Create a page called Key Sales Data that meets these requirements and include it in the Sales app. Paloma has different needs from the rest of the sales team. She works regularly with Accounts, Chatter, Reports, and Dashboards. Create a new Lightning app for Paloma that lets her focus on just these items. Set up the new app so it's the default for her profile. The leadership team at Lusso Scarpe has always fostered a culture of openness and honesty. What better tool for this than Chatter? New users at the company join departmental and team groups to collaborate and make announcements. Create a Chatter group called All Lusso Scarpe Employees and give the group this description: This group is for all Lusso Scarpe employees to collaborate and receive company announcements. All employees can join the group. The group should display the following information on the right side of the page: recommended groups and individuals to follow and the most popular topics currently under discussion. A major reason for Lusso’s move to Lightning Experience is the amazing analytics capabilities. Creating the right reports and dashboards takes the guesswork out of decision-making and allows sales managers to assess the effectiveness of sales operations. Lusso's sales managers want to keep tabs on each account’s pipeline of opportunities. When viewing accounts, they want to see a funnel chart that shows the number of opportunities by stage. They also want a dashboard that shows them a few things: the probability of opportunity by stage, how much revenue the won opportunities have generated, and how much of their business is new and how much is existing. Set up reporting in Lightning Experience so sales managers get the information they need. First create a report that displays data for all time and shows opportunities by stage. Call the report Opportunities Pipeline. Add a funnel chart to the report. Then add the report chart to account records. Call the embedded report chart Opps by Stage. Let users filter the dashboard by stage. Name the filter Stage value. Lusso’s sales managers remind you that when people view the dashboard, they should see only the data they can normally view in Salesforce. Finally, John Wiseman wants to review the Opportunities Pipeline report each week. Set it up so he receives refreshed report results by email every Monday at 8:00am. You had a successful launch of Lightning Experience for the sales team. Now it's time to tackle the second phase of the rollout. This is the phase where you'll roll out Lightning Experience for Lusso's support team. In addition, you've been monitoring how well you're hitting your success metrics for the sales team, and you've been collecting regular feedback from sales reps and managers. As a result, you've identified another set of updates that will help eliminate pain points and improve productivity. The support reps at Lusso Scarpe are proud of their track record of providing quick and efficient service for customer queries and complaints. Lightning Experience provides enhanced search capabilities in Lightning Knowledge, a new Knowledge sidebar for the console, and many other enhancements. The Lightning Knowledge home page also provides list views for Knowledge (yes!) and allows reps to search, view, author, and manage articles--all from the same place. Moving Lusso Scarpe's support team to Lightning Experience is your main priority for Phase 2 of the rollout. To help support reps streamline knowledge base management so they can spend more time helping customers, enable Lightning Knowledge in Lightning Experience. Set up Lightning Knowledge to meet the support team’s needs. When viewing articles, it needs to be clear what the question and related answer are. Add custom text fields, named Question and Answer, to store this data. In the Answer field, allow support reps to format the text and enter images. Lusso’s support team creates multiple types of articles, including frequently asked questions, product-related articles, and community articles. While there’s some common information that appears in all of these articles, each type has unique fields, actions, and related lists. Configure Lightning Knowledge to include these three types of articles. Each type of article needs to display the Record Type field and the custom Question and Answer fields. Allow knowledge users to select the type of article when creating or editing articles. With Lusso’s Knowledge articles ready to go, give reps a productive environment to work in. They need to see a list view in parallel with working on other records, plus see multiple records plus their related records on the same screen. Do this by setting up a Lightning app named Lightning Knowledge. Wouldn’t it be awesome if reps could see their recently-visited primary tabs, plus their subtabs in the context of those primary tabs? It sure would, so make sure they have access to this functionality in the new Lightning Knowledge app. See their daily tasks and scheduled events. Get quick access to records they’ve worked with recently. See a list of their most recently used items. They have no need for the Assistant, nor do they need to track quarterly performance or see a list of top deals. Update the Home page so it meets these requirements. Name it Org Home and set it as the default for everyone. The TrailheaDX sidebar component on the home page in Salesforce Classic isn't available in Lightning Experience. You're getting feedback that sales reps are frequently switching back to the classic interface to use the sidebar component. Eliminate this inefficiency by making TrailheaDX available in the Lightning app named Sales. Provide alternatives to the custom links identified in the Readiness Report. Thankfully, the Salesforce developer for Lusso has already created an Apex class, a test class, and a Lightning component to make your life easier. Congratulations! With the successful completion of phase 2 of the rollout, everyone at Lusso Scarpe is now up and running on Lightning Experience.